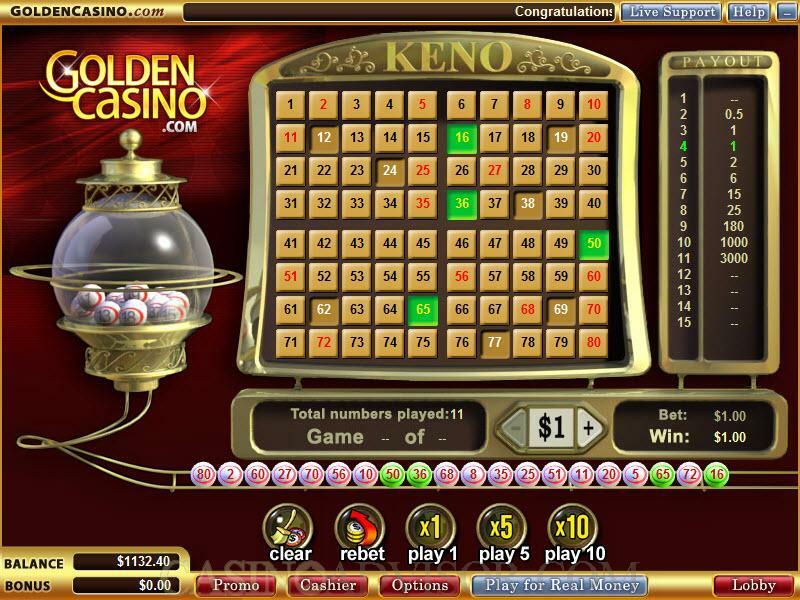 Keno is a popular online casino game and is offered by all software providers. 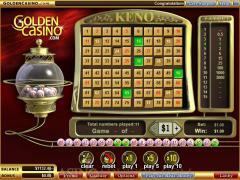 Vegas Technology too offers keno at its online casinos. The keno ticket is displayed as a 10 x 8 matrix at the center of the screen. It contains the numbers 1 to 80. The players are required to select their spots on this ticket and the called spots are also displayed there. The payout table appears to the left of the ticket. It corresponds to the number of spots selected. It shows the payout ratio for each hit. The bet amount per ticket appears just below the ticket. To the right of that is the bet amount and win amount display. To the left is the indicator for the total games played and the status of the current session. The player’s balance appears on the bottom left of the screen. The buttons for playing the game are at the bottom center of the screen The Help and Options buttons are in the bottom toolbar. The player can select up to 15 spots on the ticket. The selection is done following the usual practice of clicking on the number. A selected number can be cleared by clicking on it. The selected number buttons get depressed and appear in white. The amount wagered per ticket is set by operating the arrows on either side of the denomination. In Vegas Technology Keno the player can choose from 1.00, 2.00, 5.00 and 10.00. The player can play the ticket once or 5 times or 10 times by clicking the Play 1 or Play 5 or Play 10 buttons respectively. When the game is set in motion 20 spots are simultaneously marked on the screen. If the called spot has not been selected by the player then the number turns red. If the called spot has been selected by the player then the number turns yellow and the background turns green. The payouts are made as per the payout table and the won amount displayed. During this process there is a fantastic animation in which the keno balls get agitated in a holder and 20 balls randomly come out and line up in a slot. The player can repeat the game with the same spots and same wager by clicking any of the Play buttons. He can keep the selected spots the same and change the wagered amount. He can mark a fresh start by clearing the ticket using the Clear button. If after clearing the ticket the player want to revert to his previous selection he can click on the Rebet button. The Help button takes the player to the rules of the game. The Options button can be used to enable or disable the game and the background sounds and adjust their volume. The player can also adjust the speed of the game and enable the full screen mode. Interested in reading more detailed information about Vegas Technology Keno? If so Click Here for more details.